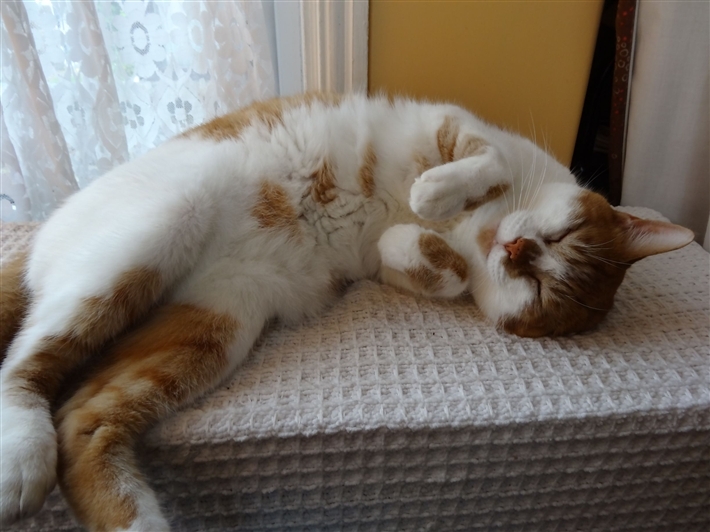 George came into CP care in May 2012 because he was exhibiting signs of stress in his previous home but look at him now, he is completely chilled out! "He is a delightful cat, very affectionate and always purring. I only have to look at him and he closes his eyes and purrs. He loves having his cheeks scratched. He spent the first two days under the bed, venturing out for the occasional explore but now the whole house has been thoroughly inspected and has obviously met with his approval. Every nook and cranny has been checked, which involved a bit of climbing! His favourite place is, coincidentally, the same place that my previous cat enjoyed the most, a sunny spot in the front room next to the window so he can look out of the window into the front garden. However any place in the house can be occupied without prior notice, including my own favourite armchair. I have got up on a couple of occasions to make a cup of tea only to return and find it commandeered! He is a nervous cat and hides the moment a visitor arrives or the doorbell rings but soon comes out when the house is quiet again.